Visitors are very welcome but do not visit if you are unwell. In particular, if you have had diarrhoea, vomiting, severe cold or flu you should not visit until you have been well for 48 hours. Please clean your hands prior to visiting. Brunel building: 10am to 8pm, with protected meal times from 12pm to 2pm. Some wards visiting times may slightly differ depending on the clinical condition of those particular patients. 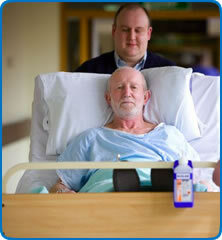 Intensive Care Unit & Acute Assessment Unit operate a more flexible system. Visiting times help us to maintain cleaner hospitals and keep our wards quieter during patients’ mealtimes. If the ward’s visiting arrangements don’t suit family and friends, please speak with a member of the ward team about this. Two visitors are welcome at any one time and children under the age of 11 (13 at maternity) are not allowed to visit unless the ward sister or nurse in charge agrees this in advance. Do not bring flowers onto the wards.